So I must confess - my Washi Tape addiction has spiraled! I am collecting it at a faster rate than I can use it. But I really am trying to use it at a quicker pace! Using my Silhouette Cameo, I cut a heart out of a 4x5.25 piece of white card stock. Then I covered a scrap of white paper with rows of Washi tape to place under the cut away heart shape. Do you ever wonder about the perfect mats on my cards? It is rare for me NOT to mat my card stock and I have a trick to share on how I do it. I always use tools from Perfect Layers. Click right here to see how magically they work! 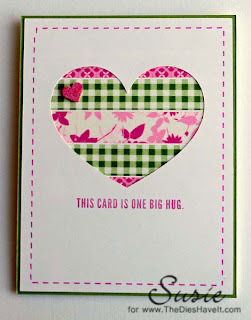 To complete my card today, I added a glittered punched heart and then my sentiment and called in done. I plan to use this technique again soon and I'll be sure to show it to you when I do. I am thinking stars next! I am part of a card club and realized I need cards this week not next :) I was thinking of a washi tape card - covering a shape with it. But, this sounds much better! Thanks for posting it right when I need it. Amen to collecting faster than using. But, if I use it I might use it up? Hence, the hording continues. Wonderful card, Susie! Love the pretty heart window and fun way to use washi tape! Thanks for the inspiration!